Clinic Synopsis: This session will explore creative programming ideas, choosing quality repertoire based on principals of aesthetics, and connecting the musicians with the audience through passionate and communicative performance. It will progress from why we do what we do in large ensembles, to planning a creative and moving program, to communicating thoughts and feelings to an audience. Examples of expressive phrasing will be demonstrated using a select trombone ensemble from UGA. Clinician Biographical Information Dr. John Lynch is the Director of Bands and Professor of Music at The University of Georgia. Previous positions include those at Kansas, Northwestern and Emory Universities. He is the recipient of The American Prize, Georgia's Creative Research Medal, the national Stanbury Award, and a Northwestern Searl Fellow for Teaching Excellence. Dr. Lynch holds degrees from Indiana University, the Eastman School of Music, and CCM, and is a member of ABA, CBDNA, and WASBE. 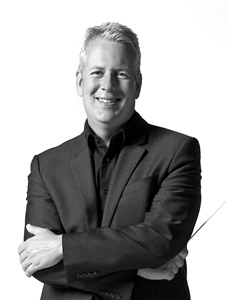 He has conducted throughout North America, South America, Europe and Asia, and has performed at the national conferences of CBDNA, ABA, MENC, The Midwest Clinic, and at GMEA, KMEA and Interlochen. He has conducted the West Point Band, the Army Field Band, and the United States Marine Band, and has held residencies at the conservatories of Alessandria Italy and Vilnius, Lithuania, and the University of Costa Rica. He has three recordings on the Naxos label and his recordings have been broadcast throughout the world.